In the early seventeenth century, Antonio Neri began preparing batches of glass for the royal family in Florence, Italy. This was a specialist vocation undertaken by alchemists, which by schooling Neri was. His job as “conciatore” involved procuring the ingredients, preparing, mixing and melting them and working with the glass artisans, adjusting the consistency and colors for the work being done. 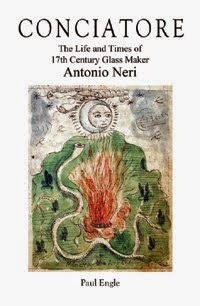 It was a position that carried great prestige, and Neri’s book on glassmaking  would cement his name in history. Shortly before Neri was born, in 1576, the grand duke of Tuscany, Cosimo I de’ Medici, brokered a special deal to have master glass artisans come to Florence and teach their secrets. These men were from the island of Murano, in Venice; the most famous center of glassmaking anywhere. 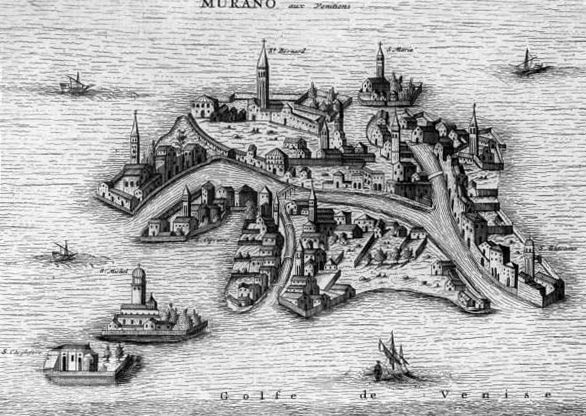 There is only scant evidence that Neri himself traveled to Venice and perhaps only once, but there is no doubt that he benefited greatly from the knowledge of Muranese workers in Florence, Pisa and Antwerp during his lifetime. Over the intervening centuries, the title of the glass batcher changed, but the tradition and prestige of glass formulation continued well into the middle of the twentieth century. In fact, even today, among the small glass manufacturers that cater to the studio glass movement, the glass batcher is considered to be something of a modern alchemist; keeper of the arcane knowledge of the chemicals and amounts necessary to produce special colors and adjust properties of the glass. In the early 1920s, a Milanese lawyer named Paolo Venini partnered with a Venetian-born antique dealer friend, Giacomo Cappellin, to start a new glass factory on Murano. Even as recently as this, the glass batcher held a respected position both within the factory and the community. Through several incarnations over the next half century Venini grew a world-wide reputation for innovative designs, of which color played an important part. They are specifically associated with the fazzoletto (handkerchief) style vase and the incalmo technique of fusing two or more colors of glass seamlessly in a single furnace-blown piece. In 1925, Cappellin split from Venini and took many of the craftsmen with him, in 1933 the new business was acquired by Pauly & C. Again, chemical knowledge and the artistry of reproducing ancient colors made a worldwide reputation. As ownerships changed hands like cards in a game and artisans shuffled between factories, it is easy to lose track of the individual glassworker. Even for a period so recent, many records exist only in the heads of the family members still living on the island. In 1956 the Stazione Sperimentale del Vetro (Experimental Station for Glass) was started on Murano with the mandate to preserve and promote the technical aspects of Italy’s glassmaking heritage. The new institution was regarded by some traditionalists with great suspicion, but as we will see, others embraced the resource. Alberico Barbini was the uncle of my father, Mario Santini and the man in charge of making the glass batch “partie” (Venetian) “partite” (Italian). He was the brother of my grandmother, Delfina Barbini. He was not the only one [in my family] who worked for Venini in the early days but the most respected. At Venini he worked formulating glass after another great batch maker, [Albino] Carrara. In the early to mid [twentieth] century the batch maker still held an important position in the factory, not like now, you know, and he kept his formulations quite secret, although this relative of mine, Alberico, was smart enough to use the most modern technology available at that time. He was different from other batch makers in that when the Stazione Sperimentale del Vetro opened, he made extensive use of it in reproducing colors. At that time, and even now to an extent, the institution was not seen as good for traditional Murano glassmaking. He later moved on to Pauly where he was in charge of reproducing the glass colors that were in use in the seventeenth, eighteenth and nineteenth centuries. First, he assisted in remaking broken or missing pieces in private collections, then later in making reproduction antique stemware at Pauly that was impossible to distinguish from the originals. You must realize that all this does not come from documents but from the memory, still very sharp and lucid, of my father.